Having scaled the heights of sell-out orchestral headline shows, ARIA awards and international festival stages, Flight Facilities are going back to what it’s all really about; the songs. In 2018, fans can can expect a renaissance of the band’s beloved singles run, a format that seems as much a return to form as a new chapter for Sydney duo Jimmy Lyell and Hugo Gruzman.“We’re at what feels like a real turning point in our career, says Lyell.“Our lives as individuals are changing and so too is our vision for the band.” It’s this vision which has already seen the release of two breakaway singles that have pushed at the edges of the band’s sound. Most recently, ‘Stranded’ pulled together a diverse range of artists, from concert pianist Piers Lane to Warpaint drummer Stella Mozgawa and previous collaborator, Reggie Watts. In a brave new world where chart-toppers are increasingly defined algorithmically and playlists are king, Flight Facilities have made an art form out of reinvention. The pair has spent the majority of their careers bucking trends in electronic music, consistently and reliably favouring the timelessness of a well-crafted song. Having racked up over half a billion streams globally, it’s clearly an approach that works. 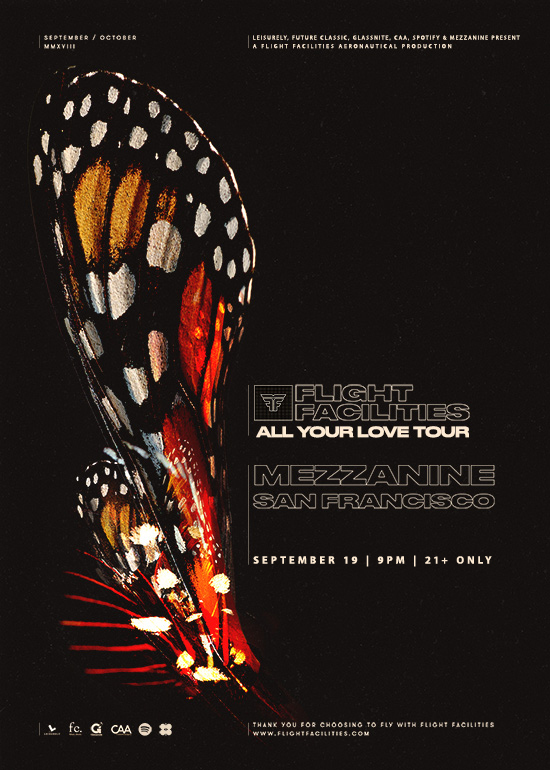 FLIGHT FACILITIES (LIVE) - SOLD OUT!